For those of you who read my blog or have a passion for HTPCs will be aware of the Raspberry Pi and how powerful it is as a mini HTPC. It’s even our budget build of choice! For many Raspberry Pi users out there, Raspbmc is the de-facto standard to bring XBMC to the tiny powerhouse. It combines all the power of XBMC with a number of Raspberry Pi customisations such as simplified Codec Key entry and Overclocking with additional features such as USB Audio card support. But who is the man behind this OS? Sam Nazarko is a 20 year old developer who has been bringing XBMC to various devices for years. From Crystalbuntu on the Apple TV 1 to OSMC on various embedded devices, this young developer is responsible for many of the XBMC experiences we enjoy today. Michael Ludvik: First, the important things. Tell me a little about yourself. Sam Nazarko: I’m a 20 year old student studying Computer Science at King’s College London. I’ve always been interested in technology (I go back to Windows 3.11 on a laptop as a toddler), and as I’ve grown up I’ve found my passion just grows. I’m writing a second book; working on a classroom hearing aid device and OSMC at night, all while trying to find time to study! ML: Can’t believe you have any spare time at all. So what’s your favourite TV show? Favourite movie? SN: I couldn’t pick just one! Lately I’ve been watching a lot of It’s Always Sunny in Philadelphia and The Office. I’m also a huge fan of House of Cards, Justified and The Killing. I don’t have a favourite film, but I think I’d have to pick the Kill Bill films. ML: How did you get into coding? SN: I’ve always been curious about how computers work from a very young age. Learning to code seemed to be an inevitable progression of getting bored of playing DOOM as a kid. ML: You’ve had a two successes under your belt already: Crystalbuntu and Raspbmc. How long did it take you to develop these platforms? SN: Crystalbuntu took around a month or so originally (I first released it when I was 16). Then later, it got a little too big for its shoes and I had to release Crystalbuntu 2.0, which modernised things. Raspbmc took about 12 months to go from an announcement to a final version. I was surprised how much there was to do, as I thought we would’ve hit final after 6. Crystalbuntu was Sam’s first distribution, released when he was 16! ML: With Crystalbuntu going so well, what motivated you to create Raspbmc? SN: I was motivated to create Raspbmc as the Apple TV 1st Generation which I supported was a dead platform. Apple no longer sold the device, and thus the number of users could only diminish. I looked for an upcoming platform that had a great form factor, offered low power consumption and would run XBMC well. That was the Pi. ML: Raspbmc has seemingly taken off amongst Raspberry Pi fans. How big is the Raspbmc/ Crystalbuntu install base? SN: At the time of writing, Crystalbuntu has about 8,000 active users and Raspbmc has over 90,000. An active user is a unique IP address that synchronises with the update server every day for 30 consecutive days. …Crystalbuntu has about 8,000 active users and Raspbmc has over 90,000. ML: How does it feel to be synonymous with XBMC on the Raspberry Pi? SN: It’s actually cool how ‘Raspbmc’ is actually how most people refer to any distribution of XBMC on the Raspberry Pi. Sometimes I fear that XBMC / Kodi may not be getting enough as an upstream product, but sadly that can be the case when a product gains large amounts of popularity. I would like to think that most users understand the relationship between Raspbmc and XBMC though. ML: We love the Raspberry Pi for bringing a fantastic platform at the right price. What do you think of the Raspberry Pi ecosystem? SN: The Raspberry Pi is a good ecosystem for hackers and beginners. What I set out to do with Raspbmc was provide a platform that was both easy to use and hackable. Beginners don’t need to delve in to anything complex, but the more experienced still have the full power to tinker with the device. The Raspberry Pi is a good ecosystem for hackers and beginners. ML: So you recently announced that Crystalbuntu and Raspbmc will be merged into OSMC. What are the benefits of merging the two platforms together? SN: Merging the codebase will remove a lot of duplication of effort. This means I can spend more time developing common features for all the platforms and makes maintenance a lot easier. Further, it will allow me to deliver a consistent and stable experience across all the devices that OSMC will run on. ML: What are the key features of OSMC? 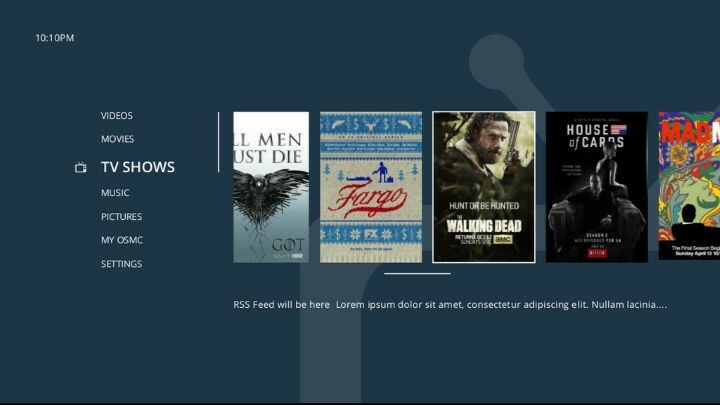 SN: OSMC improves on Raspbmc and Crystalbuntu by providing an improved update system, easy content sharing, an app store, performance improvements and much more. You can have a read at http://osmc.tv/about/why-osmc. ML: How is OSMC progressing? Have you got a targeted release date? SN: OSMC is progressing well. We are launching a Kickstarter for our new product, ‘Vero’ which will be OSMC’s flagship device, next month. I would like to see OSMC released by December. ML: XBMC is definitely our favourite HTPC frontend due to its flexibility. What do you love about XBMC? SN: I love XBMC’s principles and commitment to open source. XBMC has a very consistent and stable release cycle as well as a mature codebase which reduces time needed to patch and maintain the codebase, giving me more time to develop downstream. I love the community behind it who contribute fantastic skins and add-ons as well. ML: What do you think the future of home theatre and media playback devices will be? SN: I think and hope OSMC Vero will deliver an important message. One that shows that streaming services are not necessarily a suitable one-size-fits all solution to television, and that lots of people still have other content sources that they want to use. At the moment, we’re seeing quite the transition to streaming services such as Netflix as people’s connections get faster. But we still have an affinity with the good old hard disk TV player, which is why TiVo are doing stuff like their 24TB TiVo Mega. ML: I have to agree that we streaming will never completely replace local playback. There is definitely something nice about having something immune to playback issues stemming from network problems. So, there has been a growing market of small SoC media players lately such as the Raspberry Pi or Android Mini-PCs. What’s your view on SOC-based systems vs. the traditional HTPC? SN: The traditional HTPC can take a lot of energy and doesn’t always have the best form factor. However it is not extinct. Some low power SoCs won’t play some content that is demanding, and sometimes, people want to use hardware they have or have hardware that can perform more than one function. ML: How do you think Android TV will impact our multimedia consumption? Do you think it’ll compete with XBMC or help it? SN: I think we’ll have to wait and see. The decider as to whether this takes off will be how well it integrates with people’s existing media libraries. ML: 4K is the latest buzz in home theatre tech. What’s your view on 4k television? SN: Increasing resolutions are inevitable. We have had high resolution monitors for years and it is only recently TVs have followed suit. The current constraints on resolution are quite artificial. If we see 4K content emerging and becoming mainstream, you can be sure TV vendors will pick up on this fast and put out more 4K TVs at more affordable prices. ML: What other projects are you working on? SN: I am currently working on a variety of projects at the moment. Unfortunately I can’t talk about many of them. I am doing work on a classroom hearing aid device, working as the lead engineer for HearToday and I am writing a second book. ML: And lastly, what’s your current home theatre setup? What would you like to change? Audio: Monitor Audio BX Centre, BX 5, BXFX with Qed Silver Xt Anniversary wiring with a BKElec XLS4000 subwoofer. Display: Optoma HD25 3D Projector. Media Player: My work PC is used to play XBMC, my other devices are always being tested or developed on. I would love to upgrade my sound system, but at the moment I really can’t fault it! I just want to thank Sam for taking the time for the interview. I’m excited to see how OSMC and Sam’s other projects will continue to evolve.